This is an evening start 400k brevet, scheduled for a full moon. 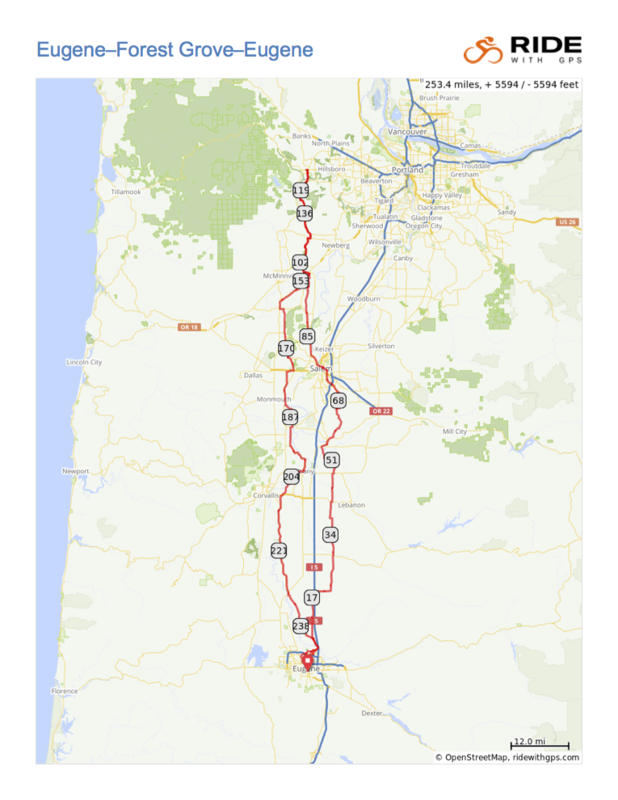 We will start at 8pm and ride through the night to Forest Grove, returning to Eugene on Saturday. Most riders do not sleep on a 400k brevet, and there are no sleeping facilities on route. This is good practice in particular if you are considering riding Paris-Brest-Paris in 2019, although PBP is much hillier than this route. The map and route have been approved by RUSA and should now be final. We will start at Falling Sky brew-pub, 1334 Oak Alley (just off 13th street between Willamette and Oak). We proceed north through Coburg, Brownsville, and Jefferson and through Salem to Dayton and Forest Grove. Fast riders may need to control at Plaid Pantry in Forest Grove (open 24 hours). Those making Forest Grove after 6am can control at Safeway on Pacific Ave. (Maggies Buns opens at 7, likely too late for most riders.) The return leg retraces part of the outbound, to Dayton, but then stays on the west side of I-5 through Independence and Albany to Harrisburg and Coburg. We finish again at Falling Sky brew-pub, which has good bike parking. I'll have U-locks to secure bicycles to a rack visible from within so that you can enjoy your food and beer. There are lots of convenience stores on this route, but no staffed controls aside from start and finish. This being July, the return leg is likely to be hot, but convenience stores are spaced closely enough that two bottles should be sufficient. Summer winds in the Willamette Valley are typically from the north. There are roughly 7 miles of gravel on this route, starting around mile 163. It's not particularly deep or coarse, but it is loose and on a couple of small hills it takes some skill to maintain traction. There is some mild washboard, and a mile or two of more severe washboard. If you have a choice of bicycles or a choice of wheels, I would favor one with 32mm or fatter tires, even though the gravel section is a small portion of the overall route. Map and downloadable track: https://ridewithgps.com/routes/27932473 ; Cue sheet (pdf) (xls). Your bicycle must be equipped with front and rear lights, which must be attached to the bicycle (not the rider). You will be riding through the night, so be sure you have adequate batteries or a generator. After dusk, you must use your lights. You must carry adequate reflective garments, preferably conforming to RUSA reflectivity guidelines. If you are observed riding in low light conditions with inadequate lights or reflectivity, you will be disqualified. If you do not own appropriate reflective gear, contact the organizer; I may be able to lend you some. This is a self-supported ride. There are many convenience stores on route, including an adequate number of markets open 24 hours, so there are no staffed controls. There is no SAG; if you abandon, you must make your own arrangements for getting home. Randonneuring rules prohibit personal support vehicles or other personal support except at the controles, which are marked on the route. A 400k (250 mile) brevet is the longest route that most randonneurs do without sleep. It can be a challenge even for very experienced riders. It is considerably harder than a supported double century like STP. At distances of 400km and up, the mental challenges are as great as the physical. 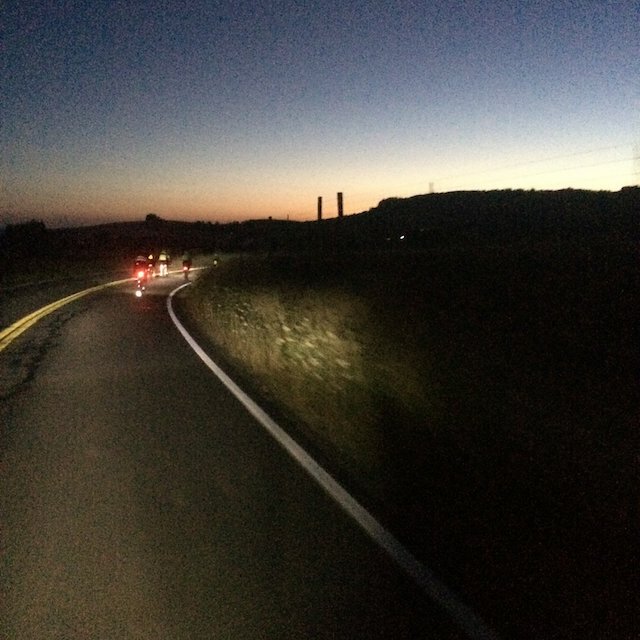 Riding with someone else, or with a group, can help you deal with the mental challenge, and you may find that riding through the night with others is a particularly strong bonding experience. Ride steadily and remember to keep eating and drinking. You should carry some food to eat while you ride. Your stomach may turn against sugar, so bring something salty and savory as an alternative. Particularly on the return (southbound) leg, top up your bottles when you have an opportunity. Although we will be entirely in the Willamette Valley, you are likely to encounter a range of temperatures because you will be riding through the coldest part of the night (typically 3 to 5 am) and the hottest part of the day (typically 2 to 4 pm). Bring layers. A light wool layer can be particularly good at working over a wide range of temperatures. Falling asleep on the bicycle is a very bad way to end a ride. The night start makes this less likely. If you rest well the night before, and take a nap sometime on Friday, you will probably find that the riding keeps you awake through Friday night and then the sun keeps you awake Saturday. But if you become very drowsy, regardless of time of day or night, you must take steps to regain wakefulness. The following approach works for many people: Find a safe place to pull off the road, with a surface where you can lie down and be safely separated from traffic. Take some caffeine (a caffeinated gel, caffeinated mints, or whatever works for you) before you lie down. Set your phone to wake you in 20 minutes. Lie down and close your eyes; sleep if you can. The caffeine will be taking effect just about the time you wake. Be safe, and enjoy the ride. I pre-rode the route starting July 14, exactly two weeks before the scheduled event. The forecast all along the route was for a low of around 57 and a high of 95, with little or no chance of rain. I considered wearing a synthetic jersey but opted for my lightest wool jersey and a very light polyester base layer. I packed a reflective wind-breaker but started out wearing a reflective sash to avoid overheating. I took sun sleeves but no arm warmers or leg warmers. These clothing choices were mostly ok. Around 3 or 4am, temperature in some spots between towns dipped into the mid 50s, and I wished I had packed long-fingered glove liners, but the cold was never really uncomfortable. On Saturday in the long hot afternoon I do not think a synthetic jersey would have been significantly cooler than my thin wool jersey (without the base layer by this time). The trickiest bit of this is along Coburg Road, just after crossing the river, where the bike lane/path is variously sidewalk, paved lane, and underpasses until you cross left onto Oakway Road. To avoid missing the underpasses, which keep you clear of conflicts with cars exiting to larger roads, you might choose to just stay on the sidewalk rather than using the bike lane bits. At Oakway Road you should use the crosswalk (there is a button to push) rather than trying to turn left across several lanes of traffic. Once you get off that horrible little segment you will be on less busy streets. The town of Coburg is about 10 miles along. You are unlikely to need to stop at the Dari Mart, but if you need a restroom you will find one in a park just one block right (east). The next 10 miles are flat and mostly straight and frankly rather boring. It will be a good time to swap stories with other riders. The terrain becomes a little more interesting as you turn off North Coburg Road onto Diamond Hill Road, crossing above the I-5 freeway. Diamond Hill becomes Gap Road and bends left (north), and then starts a modest climb. On the pre-ride, the sun was also setting and temperatures were starting to fall, but just into the 70s. The descent from the top of Gap Road toward Brownsville is just steep enough to be fun, with a sweeping turn but nothing tight. Then there is just a bit of flat and straight in to Brownsville, where Gap Road becomes Washburn Street. At the T where Washburn Street meets W Bishop Way (also signed as Hwy 228), there is a Chevron station with a mini-mart on your left. They are open until 11pm, so most riders should have time. They have restrooms and fast food, and the staff is friendly. I reached there just about 10pm, refilled a water bottle in the restroom, and bought a candy bar that I didn't really need. The Dari Mart one block farther on the route closes earlier and does not offer a restroom, but if you are after 11pm you can find a restroom in a small park half a block right on Spaulding Ave (right on Spaulding, park on your left). There are a couple rises as you continue north from Brownsville, but mostly this is a flat, easy section with very light traffic. I found it easy to keep a good pace and put some time in the bank. I got Cup 'o Noodle at the Center Market in Jefferson, which was surprisingly busy for late night. The night is cooling down, but at this point I still haven't had a need to layer up. There are a couple of short stretches on busier roads, but mostly it is low traffic and pleasant. The cool air is making it easy to keep up a good pace. The Jacksons at mile 75.3 is a good food stop with restrooms. I arrived around 2am. The coffee dispensers were empty, so I didn't get anything, but I refilled a water bottle in the bathroom sink. I may have put on my reflective windbreaker before continuing. More fast, flat, easy riding, with a few connections on busier roads. By this time I realized I was putting way more time in the bank than I had planned on, and would probably reach Forest Grove too early for breakfast at Maggie's Buns. Just a pleasant spin through the night. I got some kind of sweetened Starbucksy thing. I may have refilled a water bottle, but I'm not certain as I wasn't drinking very quickly and knew that Forest Grove was only a bottle away. Leaving Dayton I finally elected to put on my light wool coat under my windbreaker. It was the start of the coldest part of the ride, but the wool jacket and windbreaker were still too warm at points. My fingers, on the other hand, would have thanked me for a light full-finger glove liner. Just as you think you're getting out to the countryside again beyond Dayton, you pass through Lafayette, another town of around the same size. The espresso stand is not open yet at that time, so there really isn't much to say about it. Then you're on some rolling terrain through wine country, and the sun is rising. 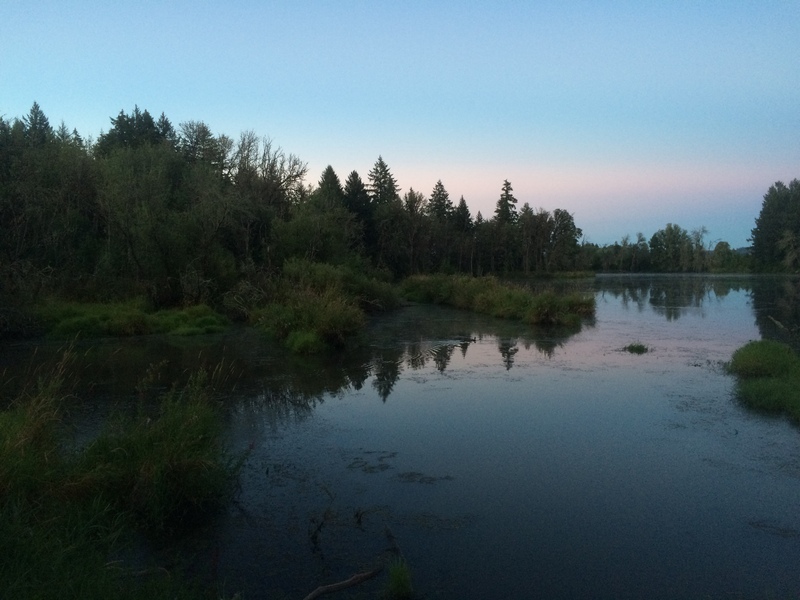 The ponds along the the road as you approach Forest Grove are lovely in the morning light. I paused to take a picture partly because the red morning light was nice on the water, and partly because I was in danger of reaching Forest Grove significantly before 6am, when the Safeway opens. I was clearly far too early to wait for Maggie's Buns to open at 8. Riders faster than me (which is to say, most riders) will be too early for Safeway and have to settle for Plaid Pantry (which does not offer a restroom) at 19th and Elm. To reach the Plaid Pantry, continue a couple blocks on Pacific Ave past the Safeway, turn left on Elm, and go one block farther to 19th. 19th is a one-way street running contrary to Pacific. Return to the route by following 19th to Maple Street, where you will be back on route by turning right. The segment from Forest Grove to Dayton is the reverse of the way out, but it's ok because it's really pretty and worth seeing twice in changing light. At Dayton you bear a little farther west on the Dayton-Amity highway, which is pretty dull, so be sure you get your fill of nice views before Dayton. Also it's warming up. I stopped at The Common Cup, which shares a building with a taco shop in Amity. In fact I had planned to get a taco and a cup of coffee, but Tacos Burros was closed, so I had a savory waffle (topped with an egg) at Common Cup. What a pleasant surprise! My caffe latte was first rate (and I'm pretty picky about coffee) and the waffle and egg made a good late breakfast. Also the restroom was clean and well-appointed ... I even brushed my teeth, which felt incredibly civilized and luxurious. Taking time to eat the waffle and chat with the proprietor about Italy and coffee and waffles ate into my banked time, but I was far enough ahead of schedule not to worry about that. If you're trying to make a fast time, you might want to have just a coffee (or a taco next door), but if you feel like a more extended break, Common Cup is a good place to take it. Fast and flat, fast and flat, nice pavement ... you were getting tired of the repetition, weren't you? Time for a little change-up. You hit the gravel section just a few miles after Amity. Actually there are two, around 3.5 miles each, with a short paved respite between. The gravel is not too coarse, and not too thick, and it looks like there might once have been some pavement underneath. There is some washboard, and there are a couple hills that would not be difficult but for the gravel, which makes it more challenging to maintain traction. I was glad to be on 42mm tubeless tires at 50psi. If you bring your skinny tire bike, you should be ok, but this will not be your favorite section. I applied sunscreen at the end of the gravel section. Don't be like me. Be smart and put it on earlier, in Dayton or Amity. There are several places to eat and get your card signed in Independence. My preference is Mootharts, a little market on the right, across from Mecanico bar. You can find some pre-cooked Mexican food in a deli case, and there are inside tables to sit down at. Across the street (next to Mecanico) is a park with public bathrooms. I was still not very hungry, but I ate most of a tamal and refilled my water bottle. This is flat or rolling terrain, quite rural. It was very warm but not unpleasant. I had planned to stop at a burger joint in Albany, but by the time I reached there the heat was really taking hold and my belly was still digesting prior meals. I stopped at a deli for a coke and, once again, topping a water bottle. Hydrate well in Albany and leave with two full bottles, because there are no water opportunities from there to Harrisburg. I have since learned from Albany natives of two better places to stop for water and food: Either just before Albany on Hickory Drive, or at Wuesten Cafe as you turn from Ellsworth onto 3rd. These are marked on the map and cue sheet. There is some suburban riding south of Albany. Then you cross Highway 34 onto White Oak road, merging into Peoria road. The best thing I can say about this section is that you'll probably have a tailwind. It is flat and straight and, unless you have a thing for wheat fields and berry farms, pretty boring. There are vault toilets at Peoria Park, mile 217, but no running water. I was making good time with the tail wind until a couple miles before Harrisburg, when my heat tolerance wore off and I slowed way down. There are several convenience stores in Harrisburg, and a Subway. The convenience stores don't offer restrooms, but there are public restrooms one block east on Smith Street, at the Harrisburg Area Museum. I stopped at the Dari Mart and had a juice drink and refilled my water bottles. This is a short, level, easy segment, on which you should have favorable wind, but for me it is memorable mainly for all the times I have dealt with stomach distress, sore feet, and general exhaustion riding the other direction on ORR Eden's Gate 400k. So naturally I was miserable again, and stopped a couple times to rest for a minute before continuing. In Coburg, a block east of the Dari Mart (to your left now), is a small park with a public restroom. I used the sink to pour water into my bottle and then over my head, and then wash my face. It was glorious. Then I rode the half block back to the Dari Mart where I sat a long time drinking a flavored, unsweetened drink. I had plenty of time in the bank, and sitting down drinking cold liquid was absolutely the best use I could make of that time. Revived by the break in Coburg, the rest of the ride in was easy and pleasant. The turn from Dale to Riverbend leads into a cul de sac. But look on your left as you turn, and you'll find a cut-through path that leads to another cul de sac on the other side, which in turn leads out to Honeywood Street. At mile 247.5 you transition off of streets and onto the River Bank path system. This path system is still a treat after many, many years of riding it, and by this time I know I'm about 30 minutes from the finish. The path leads all the way back to the bike bridge you took on the outbound leg. We take 4th street to Pearl, then Pearl south all the way to 14th street, right (west) to the alley after Oak and before Willamette street, and right up the alley to Falling Sky brew-pub. The pub has good food (not cheap) and good beer. The bike parking is visible from inside, and I'll have a couple U-locks so that you can secure your bike sufficiently if you want to take some time to drink, eat, and tell your tall tales of riding through night and day and in and out of weeks and almost over a year to where the good beer is.